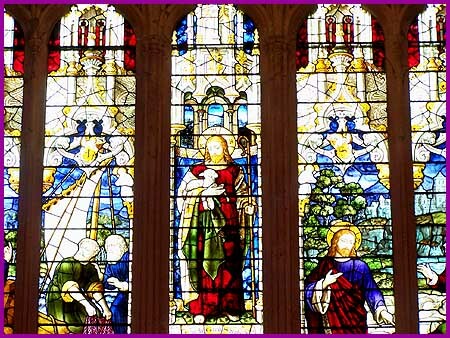 Some of the stained glass that adorns St Mary’s to the Glory of God. 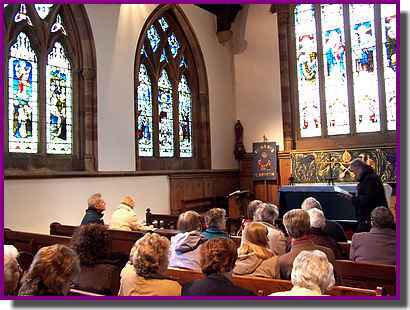 At a Mothers’ union meeting in Church in March 2012, Sue Attenborough shared that she, like a lot of us, love and gain inspiration from the stained glass windows in church. In depth research had been done over twenty years ago, but few had read the booklet produced. Sue showed us a prayer at the back of the Peter Chapel which exhorts us “to ponder the windows” which was what we did for the next hour! 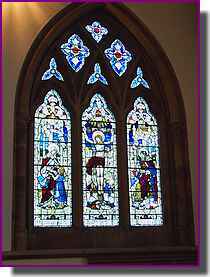 The East window in the Peter Chapel was presented by the Rev Muirhead Evans in memory of his parents in 1891. It is full of imagery connected to the Apostles, Peter in particular with a rock, an inverted cross and keys. Sue pointed out the lilies Joseph is holding as a symbol of purity. 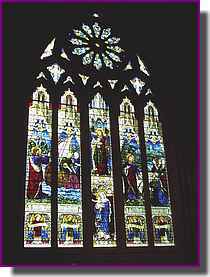 The Rutland window on the North wall was dedicated to Janetta, Duchess of Rutland, in 1899. 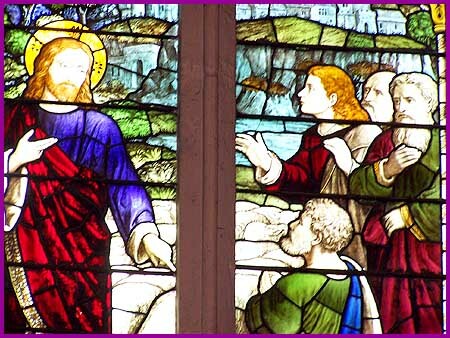 The central window shows Christ’s Ascension, with the nail marks visible on hands and feet, such is the detail in the stained glass. The panels on each side are of Jesus’ birth. 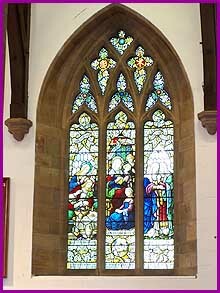 The other window’s central panel (right) shows Christ’s crucifixion. It is in memory of Elizabeth and Robert Wood, who was a surgeon and had connections to Ball’s factory hence Dorcas in the left panel and St Luke on the right. The East window (left) behind the High Altar was installed with monies raised by public subscription to the memory of Rev. Muirhead Evans, who was Vicar from 1887 to 1907. 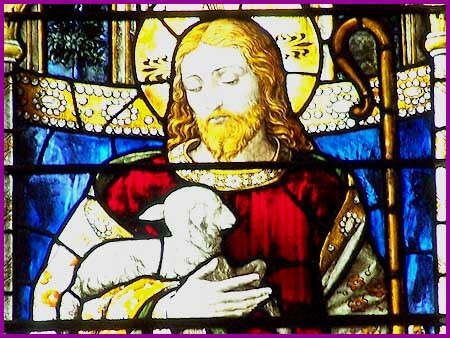 We are all familiar with the beautiful images from Jesus’ life and Andrea pointed out the four angels with scrolls, the lilies in the rose window, IHS, which is greek for Jesus Christ Saviour, the alpha and omega symbols and, at the very top, the dove. The windows on the South wall in the nave depict Faith, Hope and Charity in memory of Sarah Green and the other dedicated to the Hodges, with the resurrected Jesus holding out his hand in blessing. The scene below shows the family at home in Nazareth in great detail. 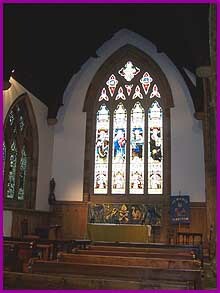 The three nave windows on the North wall, described by Janet, are all very different. One shows various women in the Old and New Testament in dominant roles displaying loyalty, obedience, and caring. Another, in memory of Thomas and Mary Simpson, portrays the Transfiguration and the middle one commemorates the Royal visit in 1914 to open the secondary school, the first Royal visit for 300 years! Copyright © 2019 St Mary's Church, Ilkeston. All Rights Reserved.